The roots of compassion collective wishes you a delightful world vegan day tomorrow! Today we already start with our “High Five” celebration week. Plus: we’ll donate 5 % of your order’s total to one of the five organizations mentioned above (and below). During this year we’ve already presented & supported these organizations but we’d like to draw your attention to their work again. And that’s how it works: the 5 % discount is deducted automatically. Additionally, we donate 5 % of your order’s total to one of these organizations. Therefore, please add one of the free linked “products” with the name of an organization to your shopping cart, order & pay. 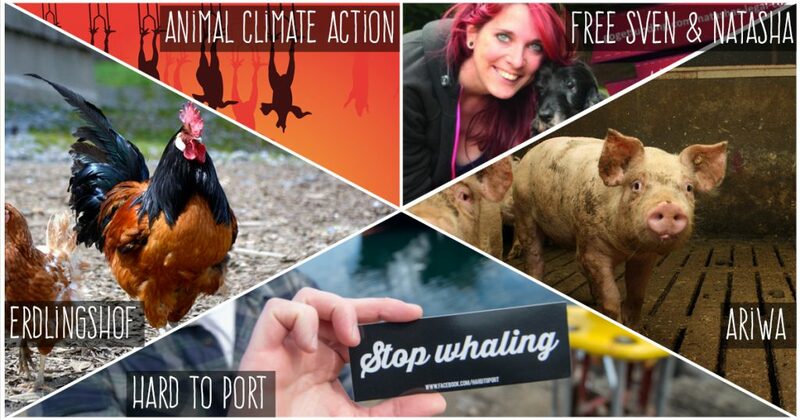 And these are the organisations: Animal Climate Action, an alliance of animal rights and ecology groups, the animal sanctuary Erdlingshof, the support for Sven & Natasha who face extradition to the UK because of actions against HLS, the German animal rights organization ARIWA and Hard To Port who fight whaling in Iceland and elsewhere. Previous Previous post: Other animals are here with us & cows have emotions, too!